Is bunscoil Chaitliceach chomhoideachais í Gaelscoil Chluain Dolcáin atá tiománta do thimpeallacht dheacriatha chombhách shona shocair a chruthú dár ndaltaí, timpeallacht ina n-aithnítear riachtanais intleachta, spioradálta, choirp, mhorálta agus chultúrtha na ndaltaí agus ina bhfreastalaítear ar na riachtanais sin. Cé gur scoil éitis Chaitlicigh í Gaelscoil Chluain Dolcáin, tugtar aitheantas coir inti do gach aon chreideamh eile. ​Tá Gaelscoil Chluain Dolcáin tiománta d'fhorbairt phroifisiúnta agus phearsanta a cuid múinteoirí, bíodh sin i gcás an mhúinteora aonair nó i gcás na múinteoirí mar aonad, agus sin a dhéanamh le cabhair clár forbartha foirne. Spreagfaidh Gaelscoil Chluain Dolcáin páirtíocht na dtuismitheoirí trí theagmhálacha scoile/baile agus trína mbaint le cairde - Cumann na dTuismitheoirí. Deanfaidh Gaelscoil Chluain Dolcáin iarracht ar chur le féinmheas gach aon duine a bhaineann le pobal na scoile, ar an meas ar dhaoine eile agus ar shealúchas daoine eile a neartú sna daltaí agus meon na freagrachta a spreagadh iontu. measc na múinteoirí agus na ndaltaí. ghnáth-theanga i measc na ndaltaí agus a dtuismitheoirí ina saol lasmuigh de ghnóthaí na scoile. 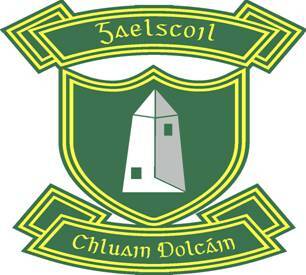 "Éireoidh linn le Cúnamh Dé"
Gaelscoil Chluain Dolcáin is a co-educational, Catholic, primary school which strives to provide a well-ordered, caring, happy and secure atmosphere where the intellectual, spiritual, physical, moral and cultural needs of the pupils are identified and addressed. While Gaelscoil Chluain Dolcáin is a school with a Catholic ethos, it also has due recognition for all other religions. Gaelscoil Chluain Dolcáin will strive to promote, both individually and collectively, the professional and personal development of teachers through staff development programmes. Gaelscoil Chluain Dolcáin will endeavour to enhance the self-esteem of everyone in the school community, to imbue in the pupils respect for people and property and encourage in them the idea of being responsible. ​Gaelscoil Chluain Dolcáin will promote gender equity among the teachers and pupils.